RAMANA'S message had spread all over the world. of Bhagavan and to spend some time in his presence. Even after Ramana shed his body, the flow of visitors did not diminish. What could be the attraction of his presence? and the bond of attachment of some earlier birth. Once, a devotee lamented, "We do not know where we would be in the next birth or whether we would be able to reach your sannidhi (presence) again." Bhagavan consoled him, "Did we get together now without any connection in some earlier birth, similarly won't the present association help retain it in future births?" The first manifestation of Bhagavan's grace is to attract the seeker here. Did not Bhagavan attract Harry Dickman living in a far off place? To be attracted to Bhagavan's presence is itself the result of merit earned in several births and should not the present service result in something much better? "No one who comes here goes in vain. According to their samskara they will reach the next higher step," said Bhagavan. Some devotees revealed that Bhagavan himself inspired them to visit the Ashram. In 1933, a school teacher of Maharashtra visited the Ashram. His experience was as follows: "Why don't you visit me?" said the Swami to him in a dream. "I don't know who you are," was the reply in the dream. "I am Ramana," said Bhagavan. "I have never heard of you. I also do not know where you stay." "You come to Madras and make enquiries." "I am too poor to undertake the journey. Where am I to get the money from?" "Go and ask (such-and-such) Seth," Bhagavan named the Seth. After this conversation, the teacher woke up from the dream. He had no acquaintance with the Seth named. But the matter did not stop with words. On his way to the school the next morning, the teacher noticed a jeweller's shop in which the particular Seth was seated all alone. The teacher went in and told him about the dream. The Seth was familiar with Ramana's name but did not know where the Mahatma lived. 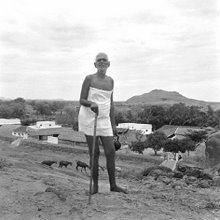 Without uttering a single word he gave the required amount to the teacher who made the journey to Arunachala. This was something like God himself appearing and forcing a boon. Some, tormented by worldly affairs reached the presence for consolation and peace. body but the Self cannot be killed. Is it not indestructible? Yet what is the use of killing the body, you may acquire a tortured body. It is only that one with the body experiences heaven and hell. There is another point. The sastras [?] say the next birth would be according to what one thinks of at the moment of death. What if you think of a demon at the last moment? You could be reborn a demon. Isn't a human birth better than that of a demon? So, even if you give up the physical body, the suffering associated with the body cannot be avoided. The best thing to do is to kill the thought which identifies ahamkara (ego) with the Self." For some, a visit to Ramanasramam became a matter of satisfaction and for some others, an event to brag about. Lately, Maharajas have been frequenting the Ashram. As a result, a visit to the Ashram has become a status symbol among the rich and elite circles. Some visited the Ashram as a place of pilgrimage. Recently an American lady came all the way from America, spent a few hours at the Ashram and went back the same evening. Bhagavan commented: "Have you noticed her devotion? She felt a mere darshan was more than enough!" Some visit the Ashram to establish the superiority of their religion. One such was a Muslim who began arguing with Bhagavan. Yet Bhagavan undertook to answer his questions patiently. The visitor asked Bhagavan, "Has God a form?" If so, is it proper to give Him a form and worship His images? Sure enough and you see it. But I am not God. Bhagavan: So you say that you are this body made of flesh, bones and blood. Bhagavan: You say so because you see it now. But during deep sleep you don't see it. So, who are you? Even then I am only this. After all, we see it before going to sleep and after the sleep. Then I am dead and buried. Bhagavan: If you are buried will you accept it? Why does not the body get up and protest against being buried? If so, I am not the body. I am the life in the body. Bhagavan: But till now you thought you were the body and that you had a form. The dispute whether God has a form or not lasts only so long as this ajnana [?] (ignorance) persists. Until you are able to experience the formless `I' you cannot worship a formless God. On another occasion, a Catholic missionary began lecturing to Bhagavan on his religion. Bhagavan simply kept quiet. Meanwhile, Chadwick began refuting the missionary's comments on the Bible in his stentorian voice. With that the visitor stopped his mission. Those who go about on this mission are merely satisfied with the molasses but they cannot taste the sweetness of the cane. The really cultivated must savour the overflowing peace in the atmosphere of the hall and let their emotional upheavals subside. The power and force of that current of peace as experienced by several devotees like Humphreys and Paul Brunton has already been alluded to. In fact, that usually was the initial experience of Bhagavan's grace. With the subsiding of emotion and the establishment of tranquillity, a peculiar thing occurred in the presence. Seekers had several doubts on spiritual matters but all those doubts simply vanished as it were. Some even did not have to express their doubts. A lawyer from Nellore visited Bhagavan with a written list of his doubts. But in the presence he could not utter even a single word. Bhagavan himself out of abundant grace towards him said, "You may ask." went to Bhagavan and asked him whether Bhagavan was familiar with their language. Those present in the hall burst out into loud laughter. One of the devotees present told the Nepali that Bhagavan was silent all the time and that his silence itself gave the replies and that this was one of Bhagavan's ways of teaching. This mouna-upadesa could be similar to what Dakshinamurti imparted to his disciples. In earlier years, there was no practice of reciting the Vedas in Bhagavan's presence. But for some reason it was started and thus a new phase came up. Those who savoured the earlier phase of mouna [?] must have noticed the difference between the two phases. Evenings, especially the period of dusk, was one where silence reigned once. It could also be described as the meeting point of the jeeva and Brahman [?]! The mouna [?] was also interrupted either wittingly or otherwise by some who kept on raising minor points with Bhagavan repeatedly. The reason for this was rather unclear  either they wished to show off that they belonged to the inner circle of Bhagavan or wanted to know answers straight from Bhagavan for the sake of authenticity. Some of these points related to Bhagavan's life story as already recorded in books or to their own mundane life. Yet, some others attempted to show off their erudition. Some others exhibited their musical talents in Bhagavan's presence perhaps under the impression that it was all seva. and hot. Bhagavan is the personification of agni. To be in his presence is itself to be in the midst of fire. Those who perform japa in the presence of Bhagavan will feel unbearable burning sensation within. The results of any act performed in a sacred place will be pronounced. Similarly for acts performed in Bhagavan's presence. Be cautious in your japa." Transformation of the individual in Bhagavan's presence would always be intense and fast. Those with good tendencies got attracted and their transformation also would be speedy. This also was a manifestation of Bhagavan's grace. It is not possible to describe the grace of Bhagavan when he was silent. By looking at his eyes one could notice how indifferent he was to the world around him. It was at such moments that the waves of peace emanating from him could be experienced. Also, devotees had various other experiences  like visions, hearing sounds and even an experience of that nameless and formless state -- all these due to the power of the presence. In any case, as all these were purely personal experiences, nothing more can be said of them. Some, like Paul Brunton, have recorded those experiences. Kavyakantha really said so could not be confirmed but several men who introduced themselves to Bhagavan lost their wives. It was a common experience of some who came to Bhagavan to lose their close relatives  leading to their attachments getting snapped. This was also a manifestation of Bhagavan's grace. Grace by eye contact was rare. Bhagavan's vision rested on some devotee or other for a very brief moment during his mouna [?]. It resulted in a tremendous power accruing to the devotee. Sometimes Bhagavan would concentrate that power on someone. Before answering questions raised by devotees Bhagavan sometimes looked at the devotee closely. At such moments it appeared to the devotee as if Bhagavan was seeing with only one eye. Like a javelin, a ray would emanate from his eye and pierce the devotee. It meant that Bhagavan scrutinized the inner being and then replied. The brilliance of the vision would be like an electric light in utter darkness. By that grace all impediments in our sadhana [?] would be removed enabling us to continue the sadhana [?]. This could be described as his greatest grace. This could also be described as his initiation by look (kataksha diksha) which was more powerful than diksha by touch or upadesa. This was what was known as guru-diksha (initiation by the guru). A few persons, among them Kulkarni of Maharashtra, claimed that they had initiation by touch also. bestow liberation. Once a devotee asked, "When it is said that mere satsang is enough for liberation, why is any effort on our part necessary?" Bhagavan remarked, "Is it so? The walls and roof of this hall are still there  should they not have got liberation by now?" What Bhagavan meant was that effort of the seeker also was necessary to attain moksha [?]. Bhagavan also said that the grace of the guru operates only at the final stages of sadhana [?]. Though the world is not beheld by the sadhaka in the last stages, due to the persistence of vasanas [?] the Self is not experienced and it is at this stage that the grace of the guru, which really is the grace of the atma, works and bestows the Ultimate. It is the same thing that is mentioned in the Kathopanishad. Bhagavan said that only such a guru could be described as a sadguru [? ], unlike other types of gurus. He would accomplish the job in a trice. From the above discussion it would be obvious that Bhagavan's mere physical presence was the greatest grace bestowed by him. The vibrations of peace and brilliance emanating from that body conferred immense benefits on humanity. There still remained a question whether those vibrations emanated out of Bhagavan's volition or automatically. The results depended on the status of the prarabdha of the devotee. Mere contact of the devotee's body with the voluntary vibrations of Bhagavan gave good results in some cases. This was one way in which grace showed itself. some extraordinary situations Bhagavan himself bestowed grace by his own sankalpa [?]. Sundaresa Iyer once wrote a lyric where he said "Grace flows from Bhagavan." Bhagavan corrected it saying, "It is not so. It should read ? "Grace is made to flow." But who could guess what those extraordinary circumstances were? It was a common experience of many that several ailments got cured in Bhagavan's presence. All around Bhagavan everything had to be according to his sakti, there could be no contrariness or dissonance. Any such contrariness got rectified and this applied to even physical imbalances and thus ailments got cured (recall the case of Ramaswami Iyer). A number of persons had vouched that at Ramanasramam their health improved and their digestive power also increased and that such a thing did not happen at any other place. The influence of the presence extended even to the land. All the foregoing discussion could be of interest to seekers. But for the large number of children, squirrels, peacocks, dogs and unlettered persons who were very free with Bhagavan, the philosophic points were of little concern. For them Bhagavan was an ocean of bliss in which they could revel. How can anyone describe that bewitching smile or the brilliance of those eyes  they had only to be experienced, not written about. That presence was like Kailasa, the abode of Siva Sankara. Bearing and tending me in the world in the shape of my father and mother, Thou didst abide in my mind, and before I fell into the deep sea called jaganmaya and was drowned, Thou didst draw me to thee, Arunachala, consciousness itself. Such is the wonder of Thy grace! Those who take refuge at the lotus feet of the supreme Lord of Mercy presiding over Arunachala -- their minds freed of attachment to riches, lands and relatives, and to caste and the like, and ever made purer by seeking Thy benign grace -- these rid themselves (of the misery) of darkness, and in the steady light of Thy ever protecting grace, which shines like the golden rays of the rising sun, they abide happy, sunk in the ocean of bliss. To rescue me -- born of virtuous Sundara and Sundari in the holy place Tiruchuzhi, seat of Bhuminatheshwara -- from the pain of miserable mundane life, He raised me to His state, that His heart might so rejoice, the immanence of Siva so shine forth, and the Self flourish. Such is Arunachala, famous throughout the universe!